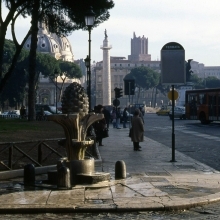 Trajan’s Column in Rome has served as a prominent landmark and a symbol of imperial power of the capital city since it was dedicated at the height of the emperor’s reign in 113 CE. 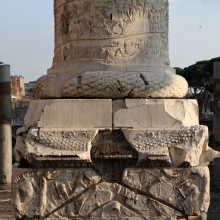 Standing today in isolation, the Column was a focal point of the great forum and market complex built by Trajan to complement a group of older imperial fora clustered on the north side of the venerable Forum Romanum itself. 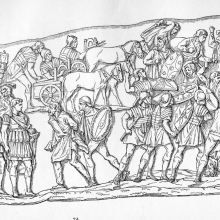 The Trajanic project was funded by the rich spoils Trajan brought to Rome as booty from the Dacian Wars, a conflict waged in two separate campaigns over the years 101-102 and 105-106 CE. 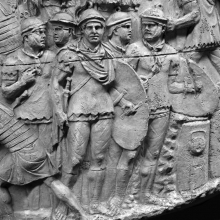 Trajan’s commemorative Column is, ironically, one of the best preserved and least accessible monuments left to us from the ancient city. 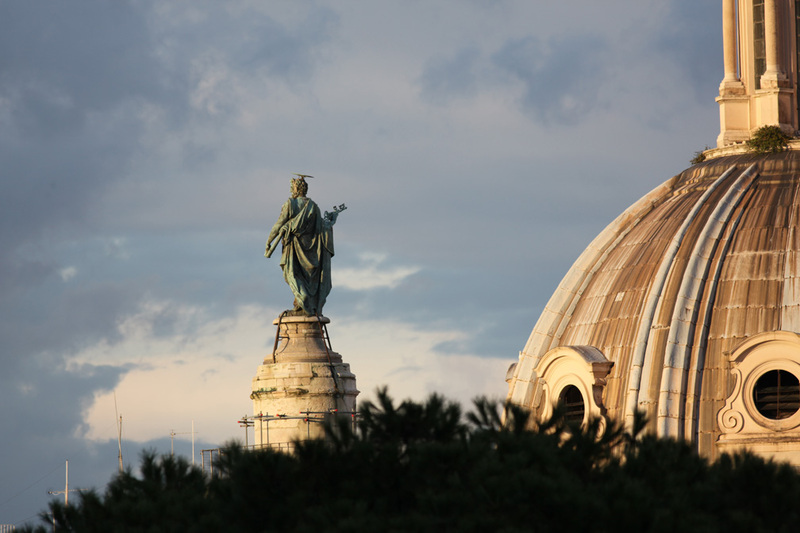 It has survived essentially intact, missing only its original painted decoration, the metal attachments that added detail to the sculpted figures, and of course the great bronze statue of the emperor himself that once crowned the top of the column (the statue of St. Peter was added by Pope Sixtus V in 1588). 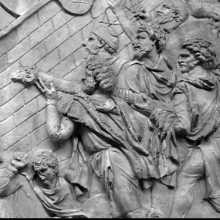 The reliefs that decorate the Column constitute a continuous frieze some 200 meters long that spirals twenty-three times around the shaft, beginning at the bottom with scenes of preparation and departure that anticipate the first Dacian campaign. 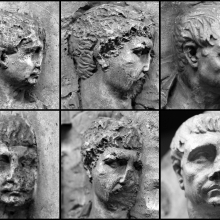 In Trajan’s day the Column stood in a rectangular court, surrounded on two sides (southwest and northeast) by libraries, on a third (southeast) by the Basilica Ulpia, and on the fourth by a monumental portal that granted access to the northwest side of the forum complex. 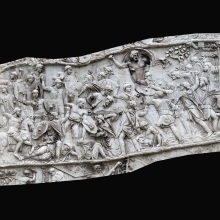 It is probable that Roman-period visitors to the forum could observe the sculpted reliefs from multiple vantage points on upper floors of these surrounding buildings. 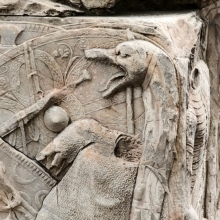 Even with this ancient advantage, only one side of the Column could be observed at any time. 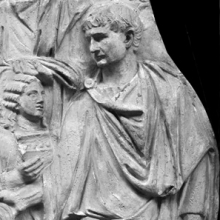 Given the prominence of this important monument and its distinctive place in Roman history, it comes as little surprise that the Column of Trajan has drawn the attention of artists and scholars from early times. Even in its own day its completion was celebrated by special coin issues that depicted its imposing height. 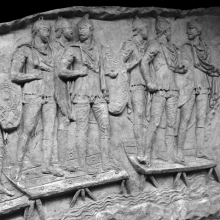 The purpose of this website is to document the history and significance of the Column through images (photographs and drawings) and text (both primary and secondary sources), with a goal of providing students of Roman history, art history, and archaeology a comprehensive understanding of the monument. The website’s overall contents can be found on the site index. If you are searching for a particular kind of scene or subject depicted on the Column, start by consulting the included glossary which offers quick links to images. See the history and sponsorship of this project. This website is being updated on a regular basis: Latest changes: 4 January 2018.